Larísa recently posted about gquits, also linking Mae's post about it. I promised a sequel on my post, but I was slacking, mostly because leveling LW is a bit easier than analyzing such topic. The previous post had two statements, one is simple and widely accepted: the best way for you to reach higher content is to leave your current guild and apply to a more progressed one, and do it until you reach the top, a guild that is attempting on new bosses in the very endgame. The second statement is not so obvious, so needed more explanation, but already accepted by some: you cannot change your current guild, if it's a Kara guild, no matter how hard you try, you won't make it a BT guild. Leaving is not the easiest option, it's the only option to reach higher content, unless your guild is progressing constantly, with an acceptable speed. However many, like Mae claims that while it's maybe true, it's also selfish and places one man's interest over 9/24 others's. It would be way too easy to say, "this is the goblin way, all man for himself". As I promised in the introductory post, goblin philosophy is positive and does serve the good of the whole. Effect on those who also felt uneasy in the guild: It's not rare to have chain-quits. Lot of people are unhappy but still content with the situation. They may not see the way out, they may don't want to hurt others, they may think they owe something to "the guild", so they stay. When you make the first step, it can give them an example, a way out of their currently bad situation. They make their move, and take their chances to find a better place for themselves. So you help them. Effect on those who lived in a social bubble: Unless server transfer involved, /gquit does not stop you to chat, instance or BG with your friends. So "/gquit breaks/betrays friendship between people (opposed to pixel toons)" is simply not true. Those who feel abandoned have a serious problem with the meaning of "friendship". Friendship is between individuals who decide to be friends because they like each other. The people who are connected not to other people but to a "guild" or other organization have problems that they must face. Usually they feel themselves small or unworthy to be chosen as friends so they expect to gain acceptance of others because of their membership. They want to think of themselves as part of something great. They cannot believe that they are great and loveable for themselves. They get very angry if someone leaves the group because they borrow their self-esteem from the group, for them "this is a bad guild" equals to "you are a bad person". By leaving you break their dreamworld. Since you cannot reach out through the internet to grab their hands and pull them to a psychotherapist, breaking their imagined bubble is the best you can do for them. Effect on the lazy/unskilled: If you are accepted to a higher tier or progression guild, you were better than the average of your previous guild. So others were worse than you, and unless you are some natural born talent, it can only mean they were slackers. Why did they slacked? Because they could! They took loot and reputation without earning it, by your (and others's) work. Of course they lost their free train to the loot by your leaving. But maybe, when the next time Prince don't drop the weekly free T4 because your 28% damage alone will be missed, they will notice that things are not for free. They may learn that no effort - no gain. If everyone would leave these lazy/unskilled people alone, they would have two options: learn or leave. The first is good for them, and both are good for the world. Effect on those who did not make backups: In Mae's situation, not "just" a guildmember, but a tank left, rendering the guild unable to raid. However the problem is not his fault. The others ignored the fact that they have no backup tank, until they needed one. Running anything without backup is extremely careless. But creating that backup needs some effort, so it's easier just to ignore it. By facing the consequences of not having backup, they may start to make backups. Not being able to raid is not the worst thing that can happen to you! Losing a year's work due to the failure of a hard disk drive without backup is a bit worse. Having your car broken down in -20C with no blankets, high energy food, drinking water and cell phone is much worse! Effect on the world: Azeroth is constantly attacked by the Burning Legion the Scourge and their lapdogs like Talon King "Trinket" Ikiss. While they are immortal and respawn every time, their army is weakened every time you slay one of them. Your previous guild was only able to slain lesser troublemakers. Your new guild, with your effort can defeat bigger ones. By leaving an impotent group to help a potent one, you help the world! And this rule is not only true in Azeroth, but in all worlds. To progress the world you must find others with whom you can do great things. Imagine that an astronaut would not /gquit his hometown, but stay with them. He had turned into an excellent potato farmer I guess, but as an astronaut he could do a bit more for his species. If the world were "fair" and everyone could get loot depending on their contribution to the raid, I'd agree with you 100%. But the fact is, while 10/25 people make an effort to progress, each of them carrying his/her own weight, the best loot usually goes to the main tank/healer first for the good of the raid group. Of course, the tanks/healers are no slackers, but while gearing up they usually get more than their "fair share" of the loot. Then, if they quit when the they're already well-geared and it's time to gear the others, it turns gearing that person up into a bad investment. Ah, at last the sequel. Thank you! I think you have many valid points and you're definitly right about the friendship issue. Friends that can't handle you moving to a different guild aren't real friends. There was another interesting post about how to handle guild quitting the other day at the brand new blog Just Another Mage Blog. I was thinking about including a comment on it in my gquit post but didn't in the end since my post was becomening so long and ranting anyway. But check it out. The two posts about guild drama is exactly about this, how a real bond of friendship can last even though you find yourself at home in different guilds. @tal: if the others agreed to give certain individuals more than their fair share, than it's their fault. They were stupid and deserve to pay for it. Giving more to one is not only stupid because he can leave the guild. Real life issues can force him to stop playing and since items are soulbound, he cannot give them to others, they are lost. NEVER give anyone more than his fair share! Gevlon as usual another excellent post and I tend to agree with you although I'm not at end game yet I have left a server Alliance side to set up residence on a new server. However, my friends didn't hold that against me. I told them I would be leaving they knew I preferred the scenery and quests on Horde. Naturally, they were sad to see me go (I was sad too) but we still keep in contact through email and they pop on my new realm to say hello and I return the favor. I stayed on the server longer than I wanted to because of the friends I made. I was miserable knowing that they would support my decision I told them and left. True friendships don't end simply because you leave a guild or decide to go to another server. I agree with you about giving everyone their fair share. 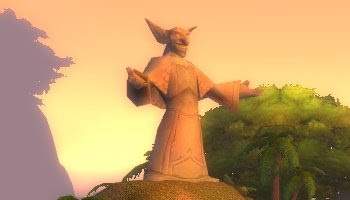 If some guilds leaders constantly look over their guildmates to play favoritism to certain classes then they have no one to blame but themselves if those players leave.